Ultramax ammunition represents serious quality for serious shooters. 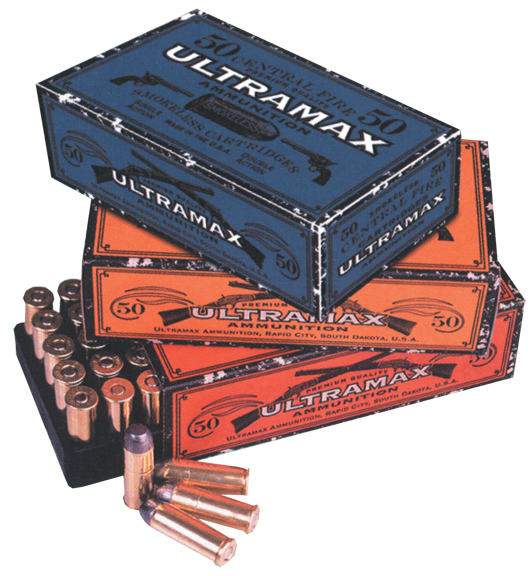 Since 1986 Ultramax has provided top of the line ammunition with a reputation for accuracy, round after round at an unequaled value. All Ultramax ammunition is loaded to SAAMI specs and a visual inspection is performed on every loaded cartridge before it leaves the building. Ultramax packages their Cowboy Action ammunition in historically authentic packaging and shoots well in vintage firearms. This ammunition is new production, non-corrosive in boxer primed, reloadable brass cases.